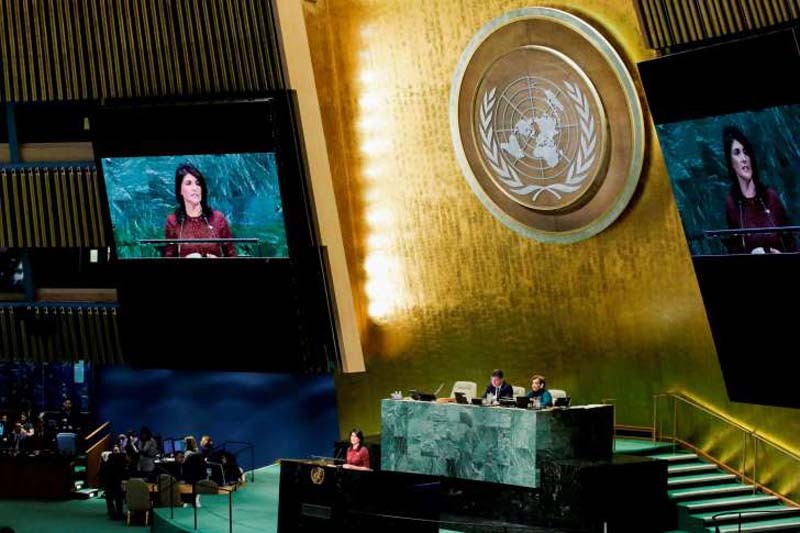 © Eduardo Munoz Alvarez/AFP/Getty Images United States Ambassador to the United Nations, Nikki Haley, addresses the General Assembly. The United Nations granted accreditation to American groups focusing on human rights in North Korea and Iran on Tuesday, overturning a committee's rejection and giving the groups the right to speak at the Human Rights Council and other U.N. bodies. The 54-member Economic and Social Council approved the application from the U.S. Committee for Human Rights in North Korea by a vote of 29-6 with 13 abstentions, and the application from the Iran Human Rights Documentation Center by a vote of 22-7 with 17 abstentions. In February, the U.N.'s 19-member NGO Committee voted against accrediting the two organizations, but the U.S. and Canada went to its larger parent body, the Economic and Social Council, where the U.S. has more support. "These votes are wins for human rights," U.S. Ambassador Nikki Haley said after Tuesday's votes. "For far too long, the NGO Committee has been overrun by serial human rights abusers that ruin the U.N.'s credibility on human rights." She said "credible NGOs should never be blocked from participating at the U.N., especially when their work sheds light on some of the world's worst human rights abuses." Before Tuesday's vote, North Korea accused the NGO promoting human rights in its country of carrying out "notorious biased, politicized" activities and said it wasn't qualified to receive consultative status at the United Nations. But only six countries supported North Korea's view and voted against accreditation — Belarus, China, Russia, South Africa, Venezuela and Vietnam. In the vote on the Iran rights center, those six countries and Iraq voted against accreditation.